South Palm Resort, the resort under development at Ismehela Hera – an uninhabited island located off the coast of Meedhoo, Addu City – is scheduled to open in June. Tourist magazine, Maldives Insider reports the South Palm Resort has 130 villas in three categories; ocean villas over-water villas and beach villas. The resort, developed by South Palm Maldives Private Limited, is a four-star resort and located a 10-minute speedboat ride away from Gan International Airport. The resort is being developed in three phases. The first phase covers the 130 villas along with a restaurant, two bars and a spa. The second phase will bring the total number of villas to 240, and the third phase involves linking the adjoining Kedevaahera island via a causeway and developing more water villas. The Ismehela Hera resort project was launched in 2015. Addu City currently has two operational resorts; Shangri-La's Villingili Resort & Spa and Canareef Resort Maldives. 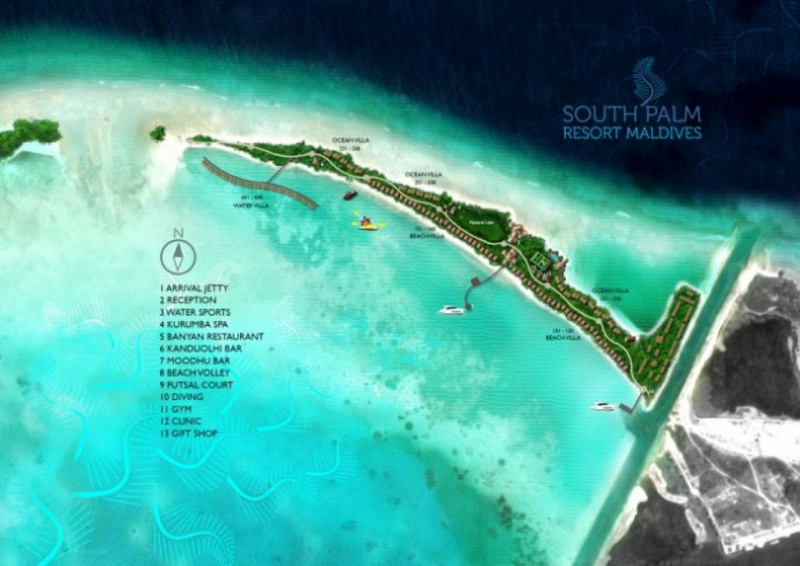 South Palm Resort, once it opens in June, will bring the total number of resorts in the southernmost Maldivian atoll to three. South Palm Maldives Private Limited recently held walk-in interviews in Addu City to recruit the staff it needs to run the resort.